In Vitro Parasitisation v Ciborinia camelliae. (1) KCS Biotech, Via Sempione 26, 21029 Vergiate (VA),Italy. Ciborinia camelliae Kohn is a fungus belonging to the Helotiales order (Ascomycota). The fungus is a high specificity pathogenic species. Up to now it has been observed only on plants belonging to the Camelliae genus (Rampinini, 2001). This pathogen is native to Japan, where it was identified in 1919 for the first time (Hara, 1919). In 1940 it was found in California (Hansen & Thomas, 1940) and has currently spread throughout North America, including Canada. In 1993, it was also observed in New Zealand where it has spread widely in the last few years (Stewart & Neilson, 1993). During 1999, this fungus was identified in some EU countries such as the United Kingdom, Germany, Spain, and also Italy. At the beginning of spring the propagules (ascospore) of C. camelliae reach the petals of the camellia and germinate quickly, producing a brownish mycelium able to colonize the entire petal (Camellia flower blight). The purpose of the fungus is to reach the base of the petals and aggregate to form structures called sclerotia. The sclerotia are black, single or aggregated, have a variable shape and often embed residues of the flowers. The flowers become brown and fall to the ground prematurely, taking on a leathery texture prior to decomposition. The sclerotia, on the contrary, remain in the soil in a latent form throughout the year until they find the ideal conditions to germinate at the beginning of the next year (Kohn & Nagasawa, 1984). These structures hidden in the leaf litter at the base of the plants produce fruiting bodies, called apothecia, easily recognizable by the thin and long stipe and a cup-shaped hymenium (Gianetti et al., 2002). The hymenium contains the asci, cylindrical structures having eight ovoid ascospores (Kohn & Nagasawa, 1984). The spores are the structures of sexual reproduction of the fungus and can be carried by the wind from a few meters to hundreds of miles away. Moreover, when the mycelium of C. camelliae colonizes the flower, it generates the spermodochia, structures of asexual reproduction, which produce microconidia from phialidic cells that are able to spread over a short distance (Baxter & Epps, 1979). The Camellia Flower Blight can be easily confused with cold-temperature damage or other fungal infections, such as Pestaliotia spp., Botrytis cinerea and Sclerotinia sclerotiorum. Sclerotinia and Ciborinia are closely related genera (Jones & Stewart, 1995). The Sclerotinia genus is primarily known as a basal rot agent of many vegetable plants. However, the C. camelliae infections are characterized by a different location from the one which generally distinguishes Sclerotinia spp. Furthermore, only the sclerotia of the Ciborinia genus encompass the host tissue, and the original cellular structure of the petal can still be detected under an optical microscope (Gianetti et al., 2002). However, only the presence of spermodochia makes it possible to ascertain the diagnosis. Currently there is no satisfactory method to control C. camelliae. Nonetheless, a few measures to partially control the disease were elaborated. These include the destruction of infected flowers, the application of a black plastic sheet on the ground under the camellia plants (Baxter & Epps, 1979), and the use of fungicides in the soil and on the flowers (Haasis & Nelson, 1953 Holcomb, 1980b). In the last few years, in order to avoid the use of the abovementioned polluting and expensive chemical and mechanical treatments, biocontrol agents have been investigated. This new strategy is still poorly studied and at the moment there are no indications concerning the development of a procedure aimed at controlling this disease in a satisfactory way (CH Taylor PG & Long 2000). 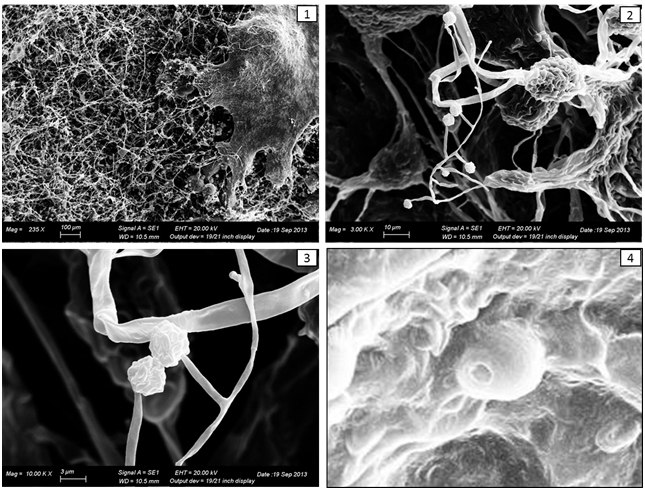 The aim of this work was to evaluate the efficiency of a commercial product based on Trichoderma spp (a wettable powder formulation containing spores of Trichoderma asperellum and T. gamsii) against the sclerotia of C. camelliae. Moreover, the influence of temperature and humidity on the production of apothecia and the course of the disease was also assessed. In addition, a method for the isolation, the sterilization and the germination of the sclerotia in vitro was performed. The sclerotia were collected at Parco delle Camelie in Locarno and Villa Anelli in Oggebbio in June 2013. The material was coarsely cleaned and preserved at 4°C. All reagents used for the experiments (with the exception of the commercial product based on Trichoderma spp. ), were purchased at Sigma Aldrich. The isolation and germination of the sclerotia were carried out on Potato Dextrose Agar (PDA)+ ab (antibiotics): PDA, 39g; H2O, 1l. The substrate was sterilized in autoclave for 15 minutes at 121°C. Streptomycin (0.005g /l) and chloramphenicol (0.005g /l) were added by cold filtration (0.2 µm). The germination of C. camelliae was evaluated by macroscopic observation of the colony (appearance, colour, texture, velocity of growth, exudates, diffusible pigments). In addition, microscopic analysis in stereomicroscopy (Olympus SZX7e Leica 205M) and optical microscopy (Olympus BX63 ) were performed. 6) Rinse the sclerotia with sterile distilled water. For the isolation of C. camelliae, each sclerotium was cut into 4 pieces (using a sterile blade). The four pieces were inoculated into Petri dishes with PDA+ ab, incubated in the dark at 24°C and monitored daily for 40 days. Macroscopic and microscopic analyses were carried out to evaluate the development of C. camelliae. Finally, the mycelium of C. camelliae was isolated in pure culture. The presence of contaminants was quantified and some of them were isolated in pure culture for future analysis. Regarding the test of the biological control, the first step was to assess the ability of the commercial product based on Trichoderma spp to grow on PDA culture medium. 5g of product were taken from a new sealed package and diluted in 50ml of H2O. Chloramphenicol (0.005g /l) and streptomycin (0.005g /l) were added to the solution in order to inhibit bacterial growth. One ml of solution was inoculated on PDA and the plates were incubated at 23° C in the dark and monitored daily for 7 days. - Trichoderma control: inoculate one ml of commercial product solution on PDA in order to assess the development of Trichoderma spp. The plates were monitored every three days and all results were evaluated on day 30. In more detail, as regards the Experiment of biological control, the number of the sclerotia colonized by Trichoderma spp was rated together with the consistency of the sclerotia after the process of colonization. In addition, optical and scanning electron microscopy analyses were performed on the colonized sclerotia. - Micro-chemical test: Preparation of slides for optical microscopy and staining of the sclerotia tissues with a Trypan blue solution as follows: Trypan blue, 0.4%; sodium chloride, 0.81%; potassium phosphate dibasic, 0.06 %. This solution makes it possible to discriminate live cells from dead cells due to the ability of the dye to permeate into the dead cells more readily. - penetrometer test: the test allows for the evaluation of the vitality of the sclerotia by calculating their resistance to breakage by compression. For this test 30 healthy sclerotia and 23 Experiment of biological control sclerotia were evaluated. This test was conducted using the Quasar 2,5- Galbadini penetrometer. 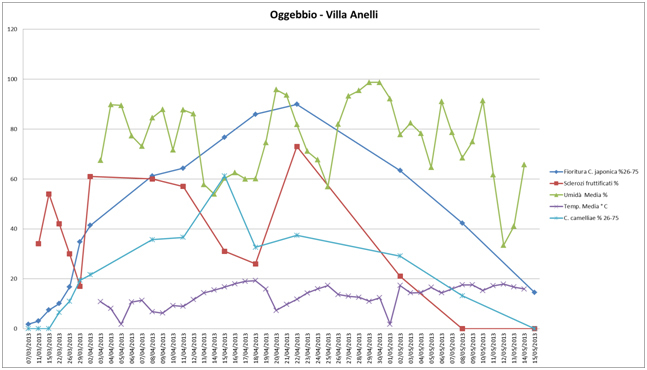 Regarding the assessment of the influence of temperature and humidity on the production of apothecia and the course of the disease, data from a previously work carried out in spring 2013 (05.03.2013 and 15.05.2013) in Villa Anelli and Parco delle Camelie were used (data not published). This data were collected with the Davis Vantage Vue weather station. All sclerotia collected at Parco delle Camelie and Villa Anelli, stored at 4°C, remained alive for the entire period of the experiments. The storage at low temperature is a good method to keep the sclerotia alive for a long period of time. The PDA represented an excellent culture medium for all experiments because it allows for a rapid development of C. camelliae, which assumes colours that provide a good visual discrimination of the species. In addition, the use of antibiotics such as chloramphenicol and streptomycin did not affect the development of C. camelliae. Isolation of C. camelliae: C. camelliae produces blackish, hard, single or aggregated sclerotia at the base of the camellia flowers. On PDA, the incubation of the sclerotia at 24°C allows for their germination after 36 hours; at 48 hours a whitish, felt-like mycelium is visible around the sclerotia. The mycelium reaches a 4 cm diameter in 15 days. At 8 days, the colony becomes dematiaceous, producing from brownish-orange to black hyphae. In addition, the texture of the colony, soft at first, becomes crusty. After 20 days the mycelium produces a black exudate (mucilage) starting from the center of the colony. This exudate protects the asexual reproductive structures (spermodochia) that appear after 25-30 days. Microscopically the shape of spermodochia ranges from obovoid to elliptical, they look brownish and with a 100-300 (700) µm size. They consist of branching clusters of hyphae ending in barrel-shaped, smooth, 6-10 x 2-2.5 µm phialides having a collarette from which uninucleate microconidia emerge. These microconidia, produced in chains, are smooth and brownish, have a shape ranging from globose to obovate, and often a truncate base consisting of two 2.5 (4) µm x 2.2 (2.5) µm fringes. No formation of sclerotia and ascocarps in culture was observed. The velocity of growth, the features of the colony and the microscopic measures of the isolated strains are slightly different from the data in the literature (Cook, 2003). Probably there is a substantial genetic variability among isolates in different geographic areas. The results showed that 100% of sclerotia survives after 2 sterilization processes. Only 5% of fungal contaminants survive after two sterilization processes. 40% of bacterial contaminants survive the first sterilization process but only 5% also resist the second sterilization cycle. This protocol is very quick, easy and represents a good method for the isolation of C. Camelliae (Figure 1). Experiment of biological control: The liquid solution of the commercial product based on Trichoderma allows for a rapid development of Trichoderma spp. on PDA. Mycelial development begins after 12 hours and after 24 hours a radial white felt-like mycelium can already be observed around the inoculum. The results of the experiment showed that 100% of the sclerotia was colonized by Trichoderma spp. after 7 days. At 40 days, the most important changes were the following: the growth of the Trichoderma mycelium on the whole surface of the sclerotium (Figure 2), the loss of hardness of the sclerotia which become soft during the compression and the browning of the sclerotia inner tissue. structures (2, 3) and conidia (4). The microscopic analysis showed the presence of hyphae and conidia of Trichoderma spp. within the tissues of the colonized sclerotia. 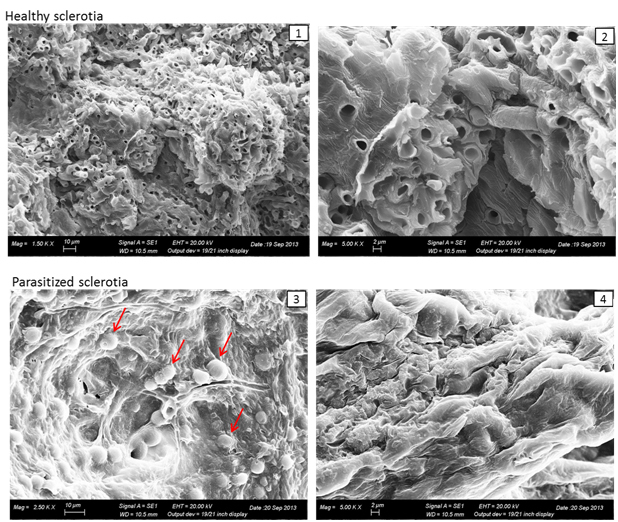 The analysis with scanning electron microscope (Figure 3) showed collapsed internal tissues in the colonized sclerotia, where it was no longer possible to distinguish the hyphal bundles. These results are in agreement with those of other authors and demonstrate that Trichoderma - in vitro - is a fungus capable of competing with other organisms for space and nutrients. parasitized by hyphae and conidia of Trichoderma spp. ; 4, Sclerotium with collapsed internal tissues. Regarding the different controls of the experiment, 95% of the t0 control sclerotia germinated in pure culture after 7 days, indicating their viability at the beginning of the experiment; 100% of the vitality control sclerotia germinated in culture medium after 7 days, indicating that the sclerotia remain alive after the incubation at 24°C for 40 days; all plates inoculated only with the commercial product (Trichoderma control) developed the typical mycelium of Trichoderma after 4 days. These results validate the experiment of biological control. The micro-chemical tests showed that all sclerotia colonized by Trichoderma are dead. 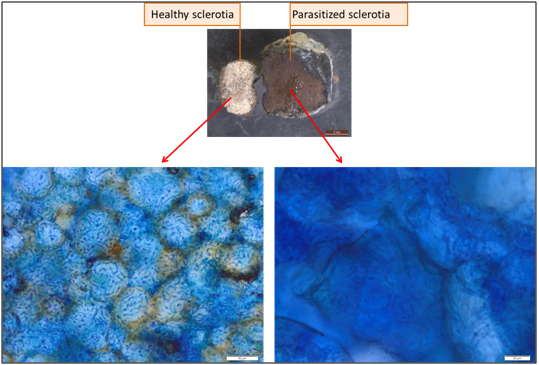 The Trypan blue reagent permeates easily into the hyphae of the dead sclerotia, whereas it does not penetrate in the hyphae of healthy sclerotia (Figure 4). Therefore, it is possible to say that these sclerotia were parasitized by Trichoderma spp. Finally, the physical test carried out by using the penetrometer showed that the healthy sclerotia have a tensile breakage strength greater than 100N/cm2, on the contrary the parasitized sclerotia have a tensile breakage strength of about 8-10N/cm2 (Figure 5). The results showed that these two tests represent quick, easy and replicable methods to assess the vitality of sclerotia of C. camellia after the process of colonization. Figure 5. 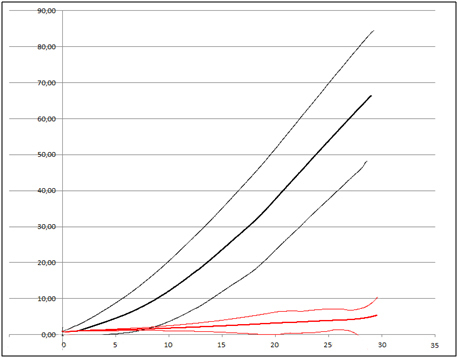 Penetrometer test: In black, tensile breakage strength of healthy sclerotia (average ± 2 standard deviation); in red, tensile breakage strength of healthy sclerotia (average ± 2 standard deviation). 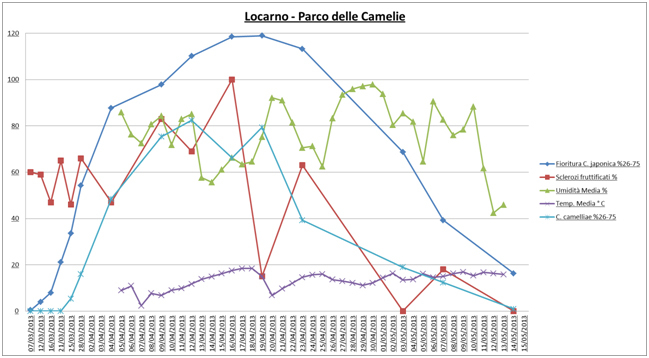 Environmental monitoring: At Parco delle Camelie in Locarno, flowering began on 12/03 and exponentially increased until 04/04. At a later stage it increased more gradually until reaching a maximum peak between the 16/04 and 19/04. The trend of the average temperature was always below 20°C throughout the period of data collection (from 04/04 to 14/05); for the entire period it was uniform with the exception of two peaks of low temperature that were recorded on 07/04 and 20/04. The humidity of the area was very variable with an average of 80%, two peaks of high humidity (90%, 20/04 and 27-30/04) and three peaks of low humidity (60-65%, 14/04, 25/04 and 05/05). The fruiting of the sclerotia was very variable: the maximum peaks of fruiting were recorded on 09/04 and 16/04 (80% - fruiting sclerotia). Regarding the course of the disease, it started on 23/03 and reached a first maximum peak between 10/04 and 12/04 and a second maximum peak on 19/04 (Figure 6). In Oggebbio, at Villa Anelli, the course of flowering was comparable to that recorded in Locarno. The average temperature was always below 20°C and there were three peaks of low temperature on 05/04, 20/04 and 01/05. The humidity of the area was very variable and comparable to that found in Locarno. The fruiting of the sclerotia was variable and the maximum peak of fruiting was recorded on 22/04. Finally, the course of the disease started on 22/03 and reached a maximum peak on 14/04 (Figure 7). - all peaks of fruiting were recorded in conjunction with a rapid reduction of the air humidity: therefore, the low humidity can probably promote the fruiting of sclerotia. This study increases knowledge about the pathogen Ciborinia camelliae, its life cycle and the methods used to study this fungus in the laboratory. In particular, the work demonstrates the ability of the commercial product based on Trichoderma spp. as an agent of in vitro biological control. Future studies will be needed to understand the effectiveness of this commercial product in the field, its correct formulation and the best mode of inoculum in the field. Baxter, L. W., Epps, W. M. 1979. Camellia flower blight control possibility or probability. Camellia Journal 34: 30-32. Cook, R. T. A. 2003. Diagnostic protocols for regulated pests. Bulletin OEPP/EPPO 33: 245-247. Gianetti, G., Balladore, P. L., Davì, L. 2002. Un nuovo organismo di quarantena in Piemonte: C. Camelliae. Direzione Sviluppo dell'Agricoltura -Settore Fitosanitario, Quaderni della Regione Piemonte n.32 - 01/2002. Haasis, F. A., Nelson, E. G. 1953. Control of the flower blight disease of camellias with eradicant fungicides. The American Camellia Yearbook, 119-123. Hansen, H. N., Thomas, H. E. 1940. Flower blight of camellia. Phytopathology, 30: 166-170. Holcomb, G. E. 1980b. Camellia flower blight control tests, 1980. Camellia (C. japonica cv. Tricolor.). Flower blight: Sclerotinia camelliae. Fungicide and Nematicide Tests, American Phytopathological Society 36, 123. Jones, E. E., Stewart, A. 1995. Prospects for the biological control of camellia flower blight. N. Z. Camellia Bull. 122: 34-37. Kohn, L. M., Nagasawa, E. 1984. A taxonomic reassessment of Sclerotinia camelliae Hara (= Ciborinia camelliae Kohn), with observations on flower blight of camellia in Japan. Trans. mycol. Soc. Japan, 25: 149-161. Rampinini, G. 2001. Il marciume dei fiori di Camellia. Clamerinforma, 26, 6: 21-29. Rossini, E. 2003. Disseccamento dei fiori di camelia causato da C. Camelliae. Servizio fitosanitario regionale ASSAM. Stewart, T. M., Neilson, H. 1993. Flower Blight - A new disease of Camellias in New Zealand. New Zealand Camellia Bulletin, 18, 3: issue 116.